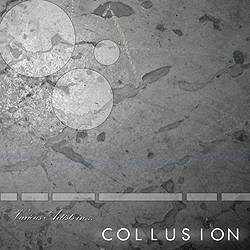 Collusion is a long play noise/dark ambient collaboration effort. The concept is simple: artists contribute minimal dark ambient or noise tracks, contributed tracks will be layered to create a continuous piece. The contributions were taken as submitted and layered into the mix. The first half of the submitted track was mixed over the existing piece and the second half was mixed with subsequent submissions (layered on as they are received). This process continued until the track length exceeded 60 minutes.